Deadlift – the most effective exercise ever invented. Due to this exercise athletes grow impressive muscle mass and dystrophic turn into tough guys. I remember my first exercise in gym lifters. It was very early in my career. Arriving in the hall, I immediately noticed the big boys, with wild cries doing deadlift. I this exercise is absolutely not impressed, moreover, seemed completely useless. Much later, after trying a bunch of programs and making a lot of mistakes, I came to understand the necessity and effectiveness of this exercise. When performing deadlifts engage the back extensors, gluteal muscles, anterior and posterior group of the thigh muscles, latissimus dorsi, trapezius muscles, biceps and the forearm muscles. Deadlift uses almost 75 percent of the available in the body muscle groups. This explains the high productivity of this exercise. And no lifting on a biceps, and extension rods on the block to replace this wonderful exercise. Look at the athlete doing the exercise. From the side it looks quite simple: quality comes to lying on the floor of the bar, takes her and straightens up. Nothing complicated. But actually in this exercise, there are lots of subtleties and nuances. In nature there are three types of deadlifts: the classic deadlift when your feet are shoulder width apart and the bottom hand are on the outside of the legs, deadlift in the style of «sumo», or it is also called wearing this Elevator operator when the feet apart as wide as possible and deadlift on straight legs. Cravings in the style of sumo is best done in boxers, his feet are tight and not slipping. Deadlift on straight legs are not a problem, because I think that she has nothing to serious intensive training and in addition, is a very dangerous exercise for your back. 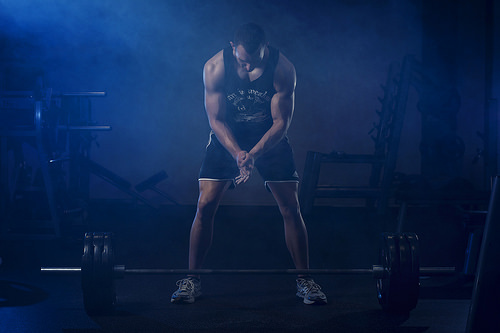 In this article we will discuss the classic deadlift. When the classic pull the legs are shoulder width apart or slightly narrower, feet parallel to each other or slightly separated. The hands placed outside of legs, perpendicular to the fretboard. Empirically it is necessary to choose the distance from the neck barbell up to your feet, so that when lifting the barbell neck from chafing your legs, and not too far from them. In this case, your lower back lie a dangerous load. Need to podobrat such a distance that the neck was moving close to your legs throughout the lift. The vulture can only lightly touch the shins. This is the optimal trajectory of the rod. The technique of separation of the barbell from the floor depends on what muscles you have stronger legs or back. If you have strong legs, start to move the muscles of the legs, the pelvis should be lowered as low as possible, and start moving as when you squat. Conversely, if your back muscles are strong enough, can perform the separation at the expense of force of muscles of the back, with the pelvis above and the main burden to lie on the extensors of the back. A very important aspect is the speed with which you perform the exercise. In no case do not perform the exercise with a jerk. Snatching technique sooner or later will inevitably lead to injury. Deadlift movement should be performed slowly and evenly. Try to accelerate the bar not at the time of separation from the floor, and when she went up, approximately in the middle part of the trajectory. I want to draw your attention to the shoes in which you intend to perform a deadlift. She needs to be comfortable and to be as thin soles. I fulfill the craving in regular sneakers, or barefoot. Many athletes use straps for the neck slipping from your hands during the exercise. I never used the straps. Not because I do not recognize, or do not know how to tie. Just there was no urgent need. If you do not have the strength of arms to hold the rod to the end of the approach, use straps. How to fix the hands on the fretboard, as shown. Always perform a deadlift in weightlifting belt. Use the locks. Went during exercise pancakes are not conducive to mastering proper technique. Never do deadlift «repulsed» from the platform. This disturbed the control rod, reducing the load on the working muscles. If you are in the middle of the trajectory realized that will not be able to raise the bar, in no case do not throw it. This can lead to trauma of the spine. Always lower the bar smoothly. Deadlift is not an exercise that should be done to failure. And last. Before setting out to conquer another weight smell of ammonia. It is specifically you cheer, and will increase the chances to set a new personal record. Benefits of Deadlifts for Men, Benefits of Deadlift, Deadlifts for Women, Romanian Deadlift vs Deadlift, Types of Deadlifts, How to Deadlift Properly, Deadlift Routine, What Muscles Do Deadlifts Work.